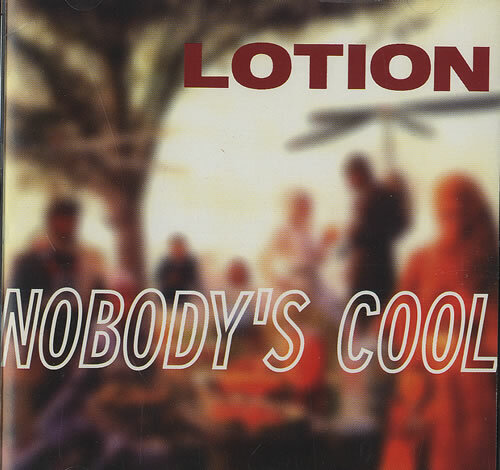 The name of Lotion’s first album is Full Isaac, which besides getting instant screams of recognition from Love Boat rerun watchers everywhere, shows an attentive nostalgia at work — not to mention some dream of an endless cruise, upon which Nobody’s Cool is the next leg of the band’s creative itinerary. As beneath the austerities of twelvetone music may lurk some shameless piece of baroque polyphony, so, throughout this album, beneath the formal demands of rock and roll as we have come to know it, between the metal anthems and moments of tonal drama, the darkest of surrealist lyrics, the most feedback-stricken, edge-of-chaos guitar passages, may also be detected the weird jiving sense of humor of a cruise combo, even an allegiance to the parameters thereof, the lounge chords on “Namedropper” and “Rock Chick,” the bass line of “Juggernaut,” so forth. But … it’s supposed to be the Millennium here — the Apocalypse, right? — worse it’s New York in the middle of a seasonal charm deficiency — and these guys are smiling? Well, not exactly. If it’s a cruise gig, it sure runs through peculiar waters, full of undetonated mines from the cultural disputes that began in the Sixties, unexplained lights now and then from just over the horizon, stowaways who sneak past security and meddle with the amps causing them to emit strange Rays, unannounced calls at ports that seem almost like cities we have been to, though not quite, cityscapes that all converge to New York in some form, which is after all where these guys are from. The recording studio is half a block from the subway. Times Square is being vacated and jackhammered into somebody’s idea of an update. Next door to Peepland, up in a control room out of The Jetsons, the band, between takes, are discussing Bobby “Boris” Pickett, on whose 1962 hit “Monster Mash” it turns out Rob’s substitute music teacher in elementary school played saxophone. Everybody here knows the record, not necessarily the Birth of Rap, less an influence than something trying to find a pathway through to us here in our own corrupted and perilous day, when everybody’s heard everything and knows more than they wish they did. It’s never certain how these things will be carried on, but mysteriously it happens. Every night, somewhere on the outlaw side of some town, below some metaphysical 14th Street, out at the hard edges of some consensus about what’s real, the continuity is always being sought, claimed, lost, found again, carried on. If for no other reason, rock and roll remains one of the last honorable callings, and a working band is a miracle of everyday life. Which is basically what these guys do. According to this August 11, 2009 New Yorker article, “The Pynchon Hoax,” the tale told about how Pynchon met the guys in Lotion is a “pynchonesque” fabrication. Andrew Essex, a former New Yorker staffer, wrote in to say that, thirteen years earlier, both he and The New Yorker had fallen victim to a prank. In “Godzilla Meets Indie Rockers,” a Talk of the Town story from June 24, 1996, Essex reported that Thomas Pynchon, a notorious hermit, had become a groupie of the nineties New York rock band Lotion. So who knows? Maybe Pynchon didn’t write those liner notes for the 1990 LP “Barefoot in Head” by Thurston Moore and two guys from Borbetomagus that are ascribed to him, either?